Spray 10-inch skillet with cooking spray; heat over medium heat until hot. Add chicken; cook about 5 minutes, stirring frequently, until browned. Spray 3- to 4-quart slow cooker with cooking spray. In cooker, mix chicken and remaining ingredients except peas and noodles. Stir in peas and frozen noodles. Cover; cook on Low heat setting about 10 minutes longer or until noodles are tender. Home-style noodles add old-fashioned appeal to this soup but you can use a cup of uncooked dried fine egg noodles instead. Chicken thighs are ideal for long, slow cooking because the rich, dark meat doesn’t dry out, as does leaner white meat such as chicken breasts. What’s better than a bowl of chicken noodle soup? Chicken noodle soup made in the slow cooker, of course. This soup preps in the morning and simmers all day long so you can come home to a delicious dinner in the evening, no hovering over the stove required. 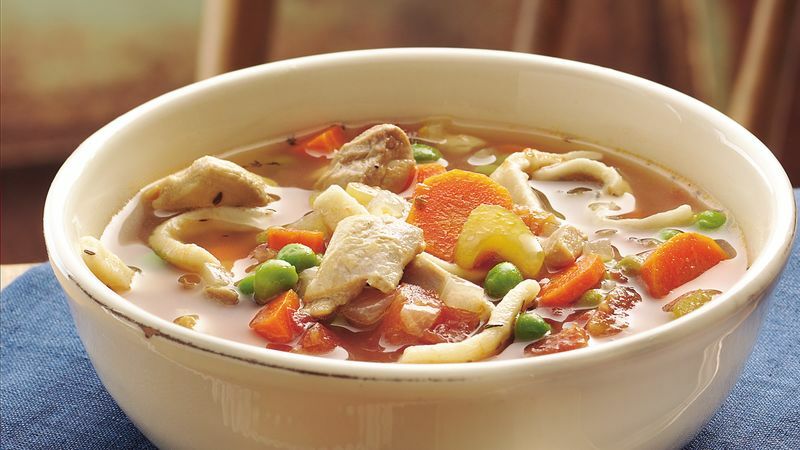 This slow-cooker chicken noodle soup gets the bulk of its flavor from chicken thighs. Though you can use chicken breasts in this recipe too, chicken thighs tend to take a little longer to cook and are more flavorful than chicken breasts, which makes them a great option for cooking in the slow cooker. This recipe calls for boneless thighs, but if all you can find at the grocery store is bone-in thighs, here’s how you remove the bone: remove the skin and trim the fat from the thigh. Then, place the meaty side of the thigh down and use a sharp knife to (carefully!) cut around the bone and (carefully!) detach it from the meat. Then cut the thigh meat into pieces and proceed with the recipe as written. Love chicken in your soup? We have plenty more chicken soup recipes for you to try next, and the sides and topping ideas you need to make them taste extra special.